High blood pressure affects more than a quarter of all adults. The condition, which is also known as hypertension, puts extra stress on blood vessels and vital organs. Making some diet or lifestyle changes could lower your chances of developing high blood pressure symptoms. These are the best foods add to your weekly shopping list, to reduce your risk of hypertension. Pomegranate, or even pomegranate juice, could slash your caches of having high blood pressure, scientists have claimed. Drinking more than a cup of pomegranate juice every day for four weeks could lower both diastolic and systolic blood pressure, they said. 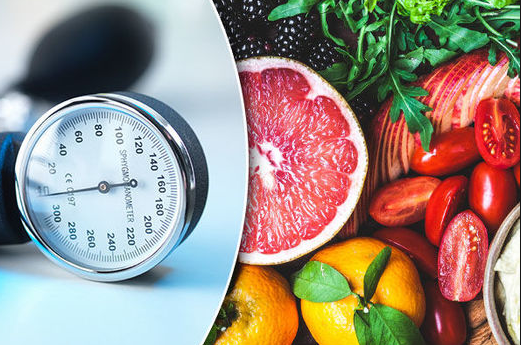 It’s not entirely clear what causes the drop in blood pressure, but it’s believed to be caused by its high potassium and polyphenol content. Beetroot juice could have a positive effect at reducing blood pressure, according to the University of California, Berkeley. “Beets naturally contain nitrates, which ease blood pressure,” it said. Its comments came after a 2013 study revealed beetroot juice could reduce blood pressure just six hours after drinking. The juice had a greater effect on men than women, the scientists claimed. Olive oil could lower both systolic and diastolic blood pressure, researchers claimed. Women could benefit most by adding more olive oil to their diet, they revealed. Look out for olive oil with polyphenols for the biggest antihypertensive effect, said Berkeley. Stay at your recommended weight. Lower your sodium intake, avoid canned goods and processed foods. Follow a diet that meets all of your nutrient needs. You need 1800 calories a day from WHOLE FOODS! Eliminate dairy and all grains. Eat, vegetables abundantly, eat fruit, high quality proteins (preferably organic), nuts and seeds.